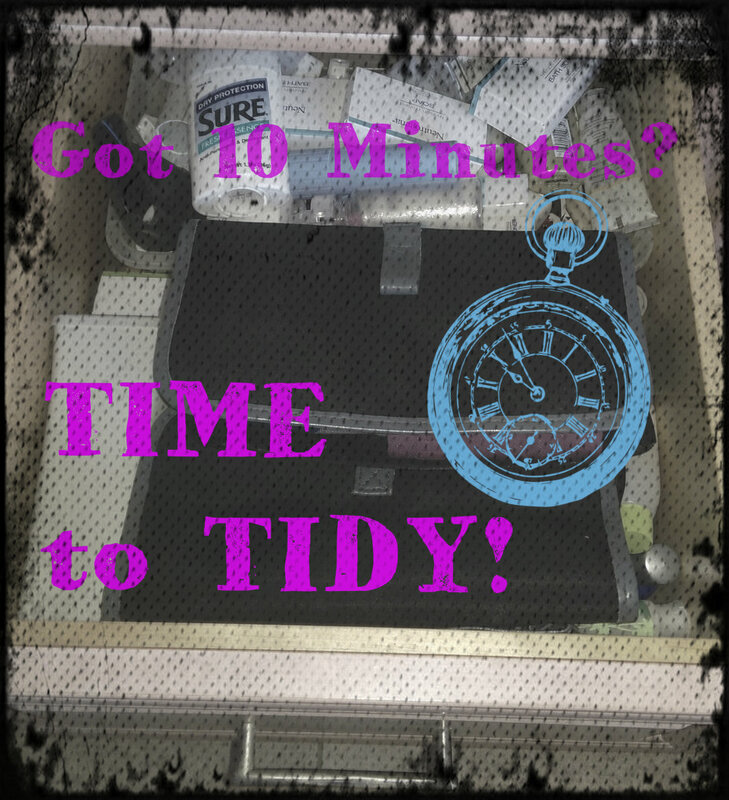 This is my first post of what I plan to make a regular feature at ARMCHAIRDECORATORBLOG: 10 Minute Tidy posts. Before I get started with my Tidy project, let me explain where this phrase came from. When my kids were younger, we had a couple of VCR cassettes of “The Big Comfy Couch”. At the end of each episode, Loonette the clown looks around her messy living room and says, “Who made this big mess?” and then speed cleans it with a “10 second tidy”. 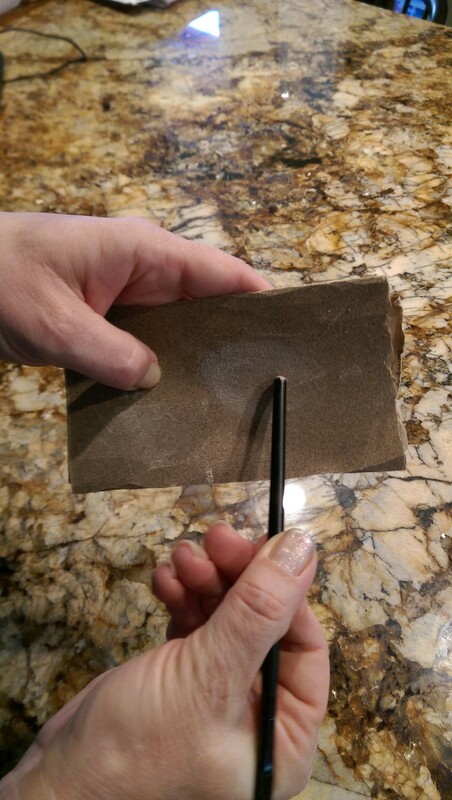 I incorporated this idea as a way of getting my 5 children to help tidy up the house quickly. The time limit depended on how messy the house was, usually 2, 3, or 5 minutes. A 2 minute tidy equated to 12 minutes of fast work if you added up all 6 of us busting a move to clean up. My kids really didn’t complain very much about these “tidies” because they knew that there was a limit. These days, I still challenge myself to do speed tidies, especially when there is a task that I would rather not do. The chores seem so much easier, and I swear I work 5 times faster when I’m focusing on beating a clock. Think how fast you accomplish tasks when you know company is almost due to arrive at your front porch. Way to much stuff in this drawer. I have been putting off cleaning it out for a long time. Realistically, I knew that the job was really not a biggie…it was all mental. With a 10 minute time frame in mind, I quickly emptied everything out and sorted like items together. Ridiculous! 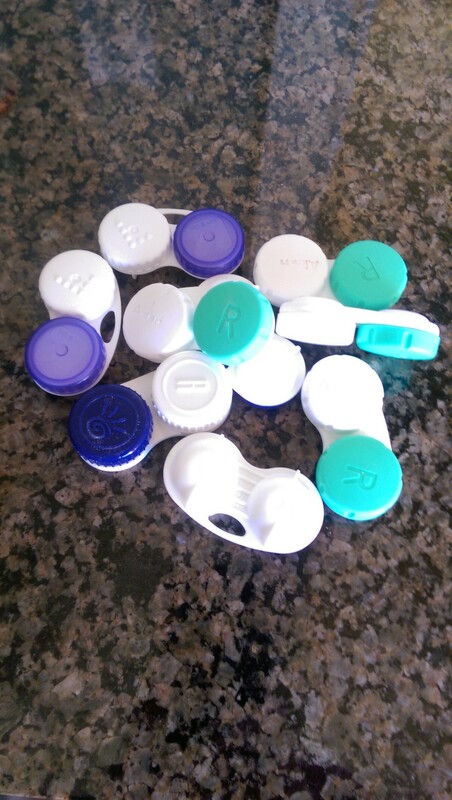 Who needs this many contact lens cases! 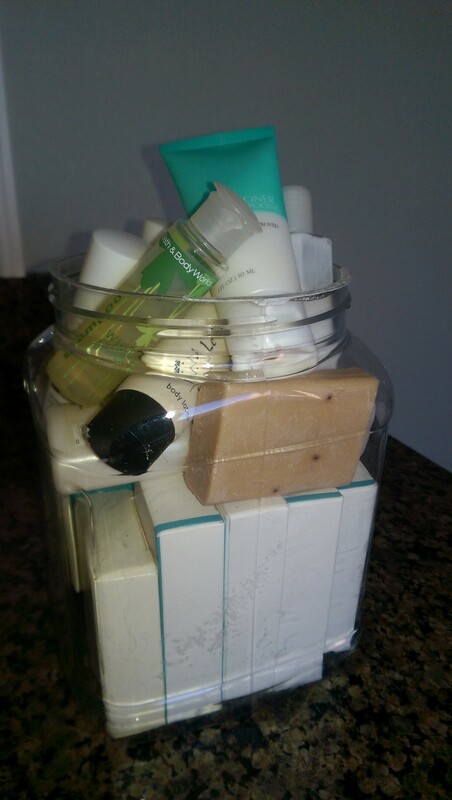 All of those little bar soaps that you get from hotels? We don’t even use bar soap around here. Note to self: from here on out… leave them at the hotel! Time to donate to a good cause. My body butter tub was nearly empty, but after squeezing the contents of all of our mini lotion containers, it was full. 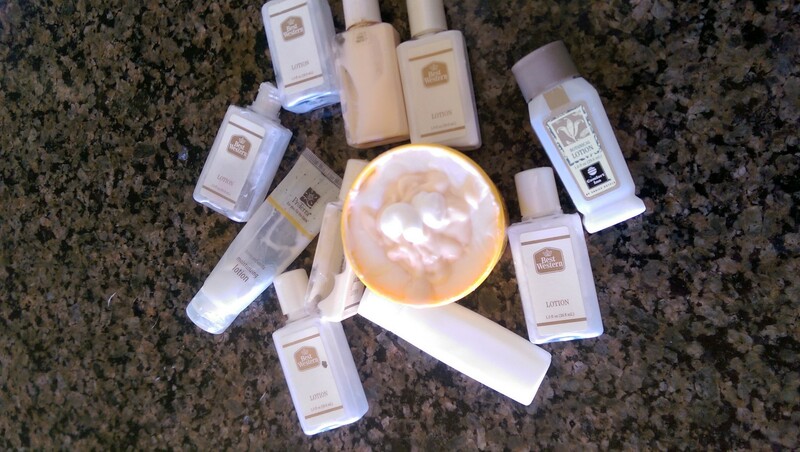 Free lotion! Those, I will keep bringing home from hotels. 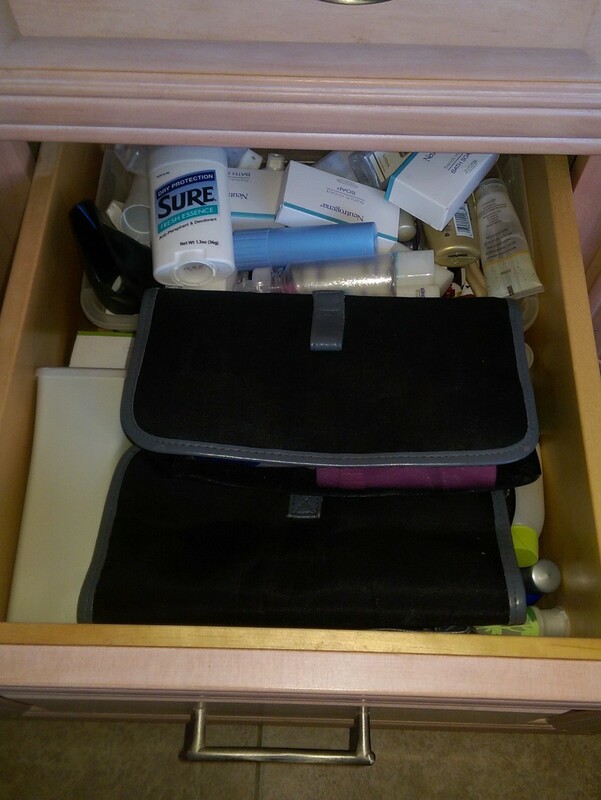 …my bathroom junk drawer is noticeably less cluttered. I don’t hate opening it anymore! What quickie project could you go do right now? How about a bathroom drawer? On your mark…get set…TIDY! A huge part of having a beautiful home is having an organized home. A place for everything and everything in its place. You can have the most beautiful furniture and décor, but if it is cluttered by stuff and stuff and stuff, you will not notice the beauty. 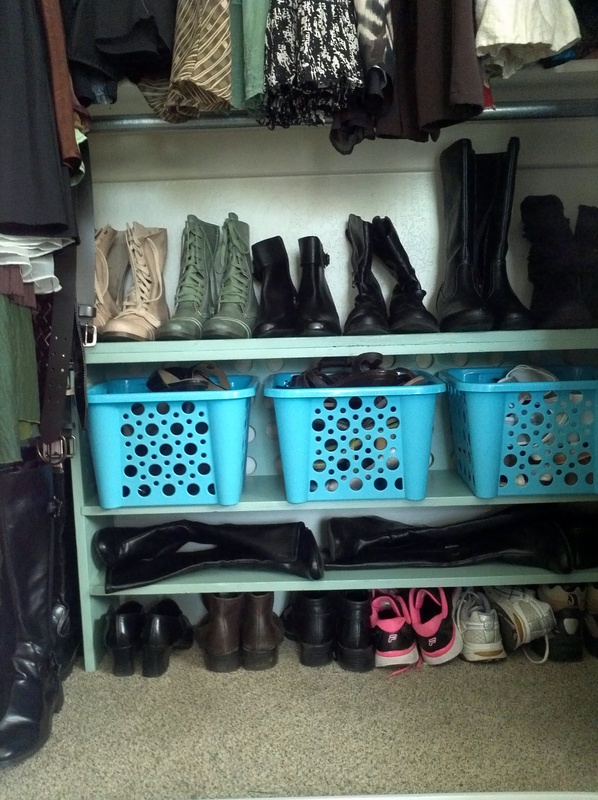 That is why every so often I like to share organizing tips. An organized home is way easier to keep clean than a disorganized home. An added bonus is the stress that is saved from having to search high and low for items you need. 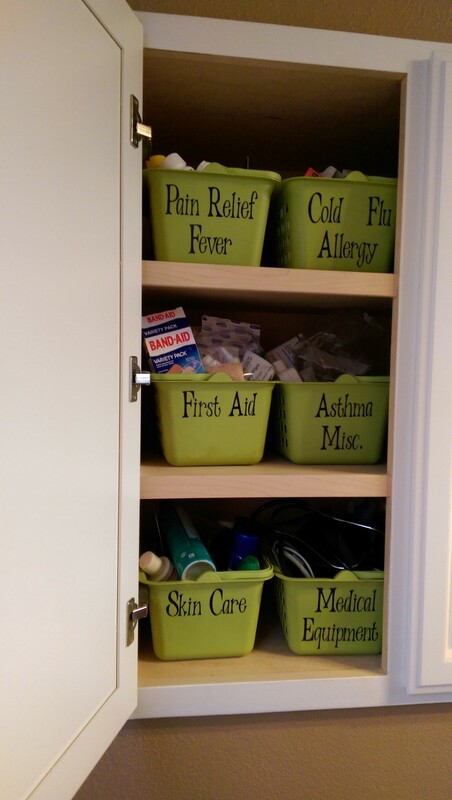 Years ago I kept all of our medications in a couple of plastic boxes above the freezer. I had 5 little children at the time and wanted to keep meds out of reach. 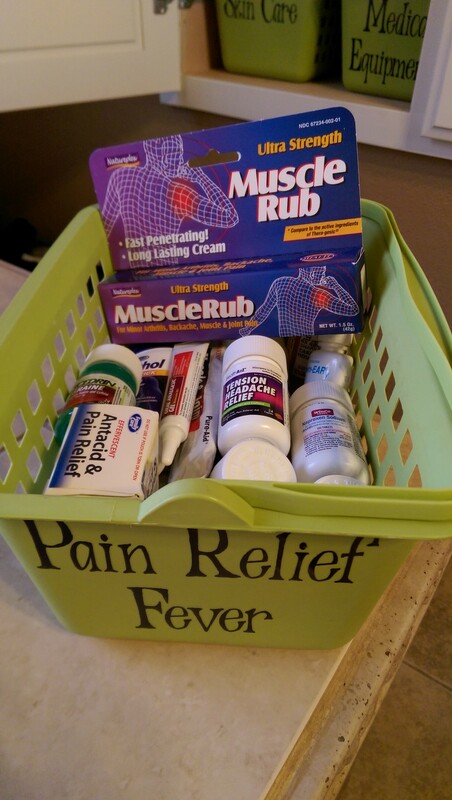 Whenever I needed a med of any kind, I had to search through both boxes to find what I needed. It was more than a little frustrating. I then organized the 2 boxes by making wooden inserts that divided the boxes into sections and that worked better, but stuff would still overflow into other sections. Basically, I just got some sturdy dollar store bins, labeled them with vinyl (I love my Roland Stika vinyl cutter!) and then separated everything into appropriate bins. I’ll admit that I don’t even try to keep each bin orderly. They are small enough that I can easily find what I need. If you don’t have a vinyl cutter, no biggie. Just print out your medical category using your computer, a fun font and your printer and tape it on with clear tape or make a sturdier tag to attach. Heck, you can even grab a sharpie and handwrite it. 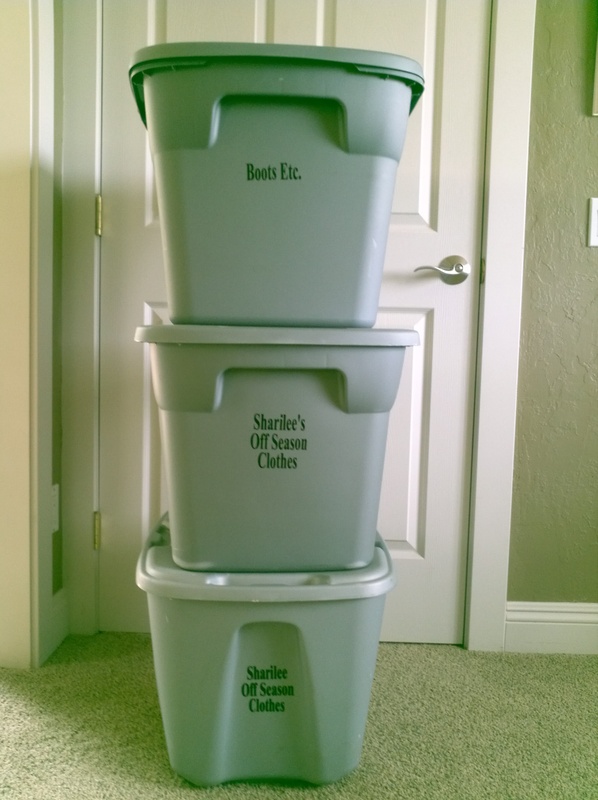 The point is to label the bins for your family’s specific needs, throw them in a cabinet, closet, drawer…wherever you have the space, and forget about it. At least until the next medical need arises. Do you every get distracted? Mean to do one thing and then start another totally different thing? 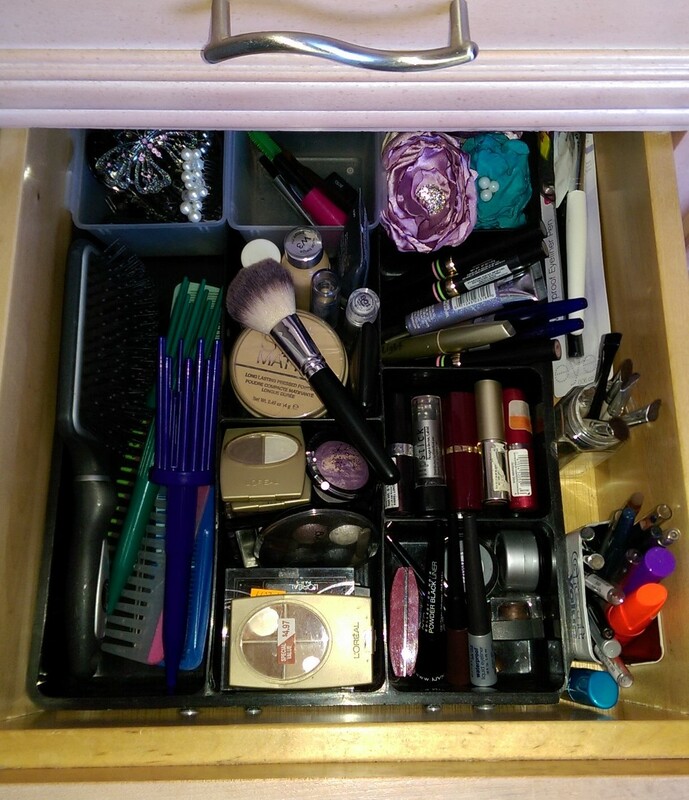 I did that today… and now I have a fully organized hair and make up drawer as a result. Distraction: not always a bad thing! Gross, huh? A mish-mash of lipsticks, eye shadows, combs, make up brushes, hair ties, etc., etc. . There was a drawer organizer down there somewhere, but the junk on top hid it. First thing, I took everything out and divided it into like piles. Of great importance was the garbage container that I placed in the sink for easy access. Then it was time to put everything (well, not everything) back. A fair amount of stuff ended up in the garbage and another bit got transferred to my teenaged daughters. 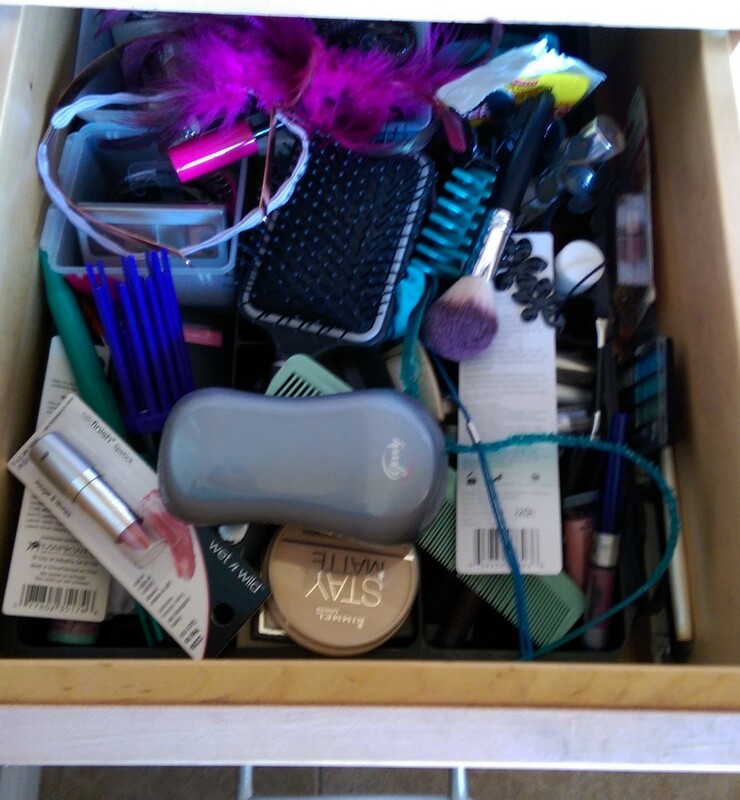 This drawer was housing all of their hair stuff (barrettes, bobby pins, hair ties, mini elastic bands, clips…). Not any more. Now that my girls are older, they tend to keep their own hair stuff in their bedrooms. My hair is now quite short and I rarely use hair stuff (see above) any more. Why in the world was I allowing all of that stuff to clutter up my drawer? Gone. 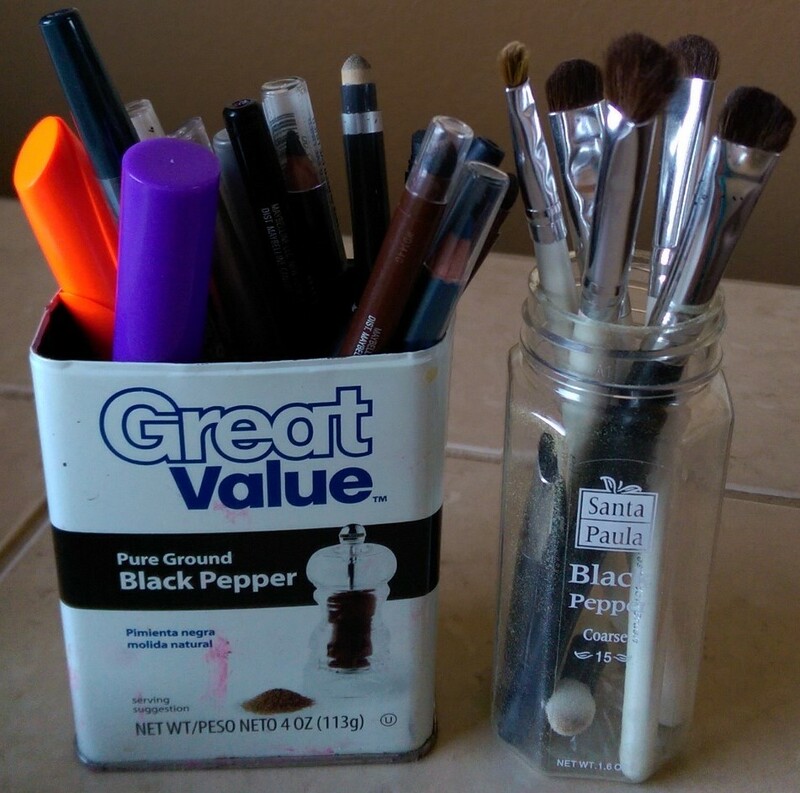 To make my eye make up brushes, eye liners and mascaras easily accessible I looked as far as my spice cupboard. Tacky? Maybe. 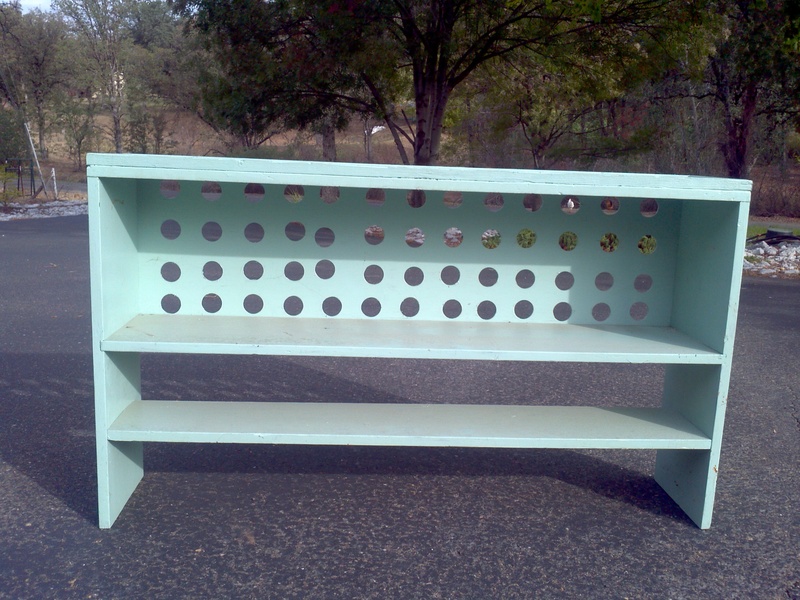 Who knows, maybe I will spray paint the tin and add a decorative paper label some day. Not today. Once they were placed in the narrow space left over after the drawer organizer was in place, I didn’t even notice the labels. Another thing, once I put the brushes in the drawer, there were a couple that were a bit too tall to stand upright. No problem. I just used wire cutters to trim a little off of the handle and then sanded them into a rounded end, which I then repainted using dark fingernail polish. Easy fix. 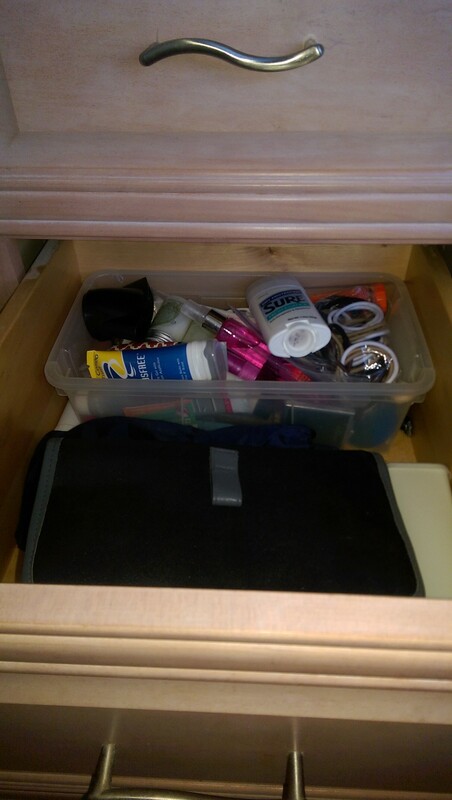 The rest of my quickie organizing project consisted of placing like items together, utilizing my drawer organizer and a couple of dollar store containers. Looks MUCH better, doesn’t it? 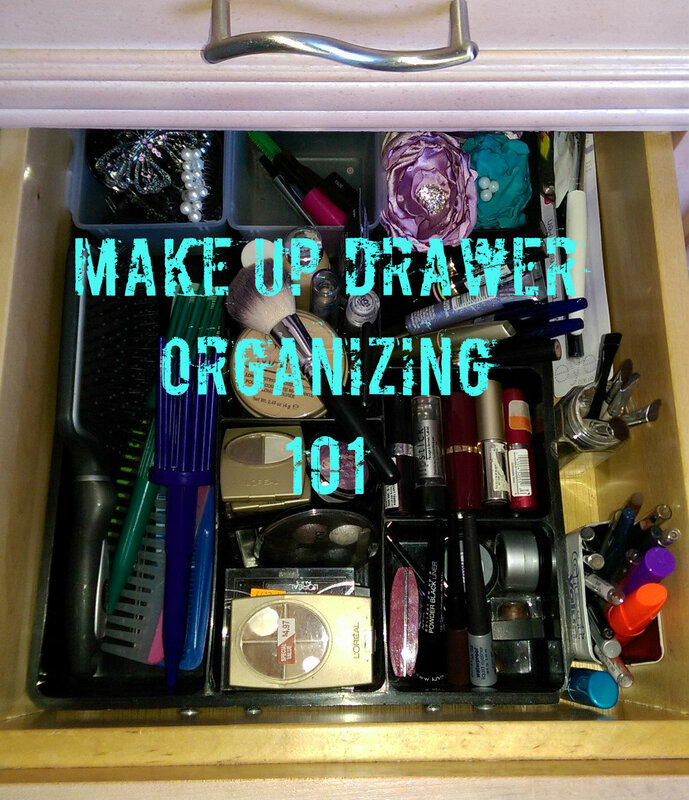 * If you don’t have a drawer organizer, get a simple silverware drawer organizer (not the kind with the spoon shapes). * Put like items with like items. * For heaven’s sake, don’t put anything back in the drawer that you will not use. * CLASS FINAL: Jump up right now and organize a drawer. Any drawer. Time yourself, start to finish and just for fun, take before and after pictures. I want to see! Sometimes we think that a project is too gigantic to do and so we don’t even start it. I have learned over the years that the only way to get a project done is to dive…right…in. Plain and simple. Get started. The pride of a job well done is well worth the 25 minutes that I spent reorganizing this drawer. 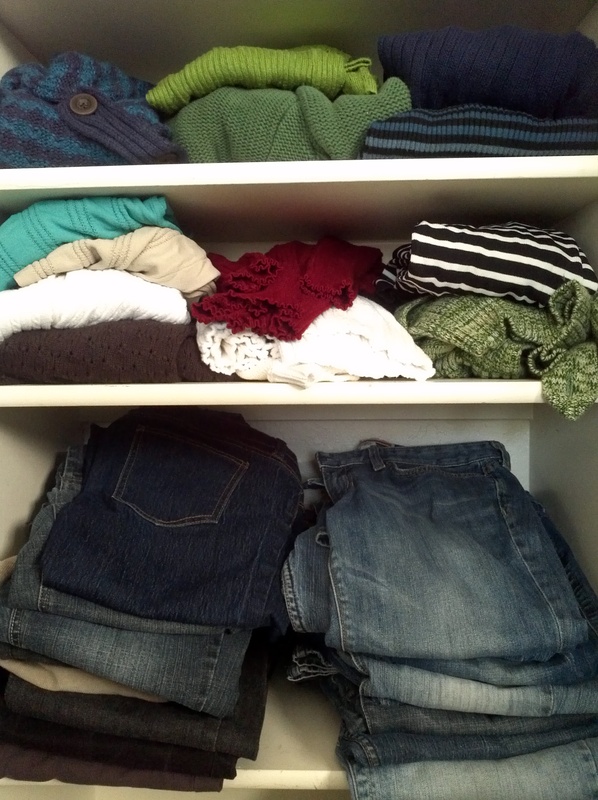 That is why I think it is great to get distracted sometimes… I have an absolutely organized drawer now. A “New” Wardrobe- Two Times a Year! By the way, that is my poor hubby’s small closet. Mine is about 4 times the size of his, yet he doesn’t complain. Good man. and I must say, it is just like getting a new wardrobe twice a year! 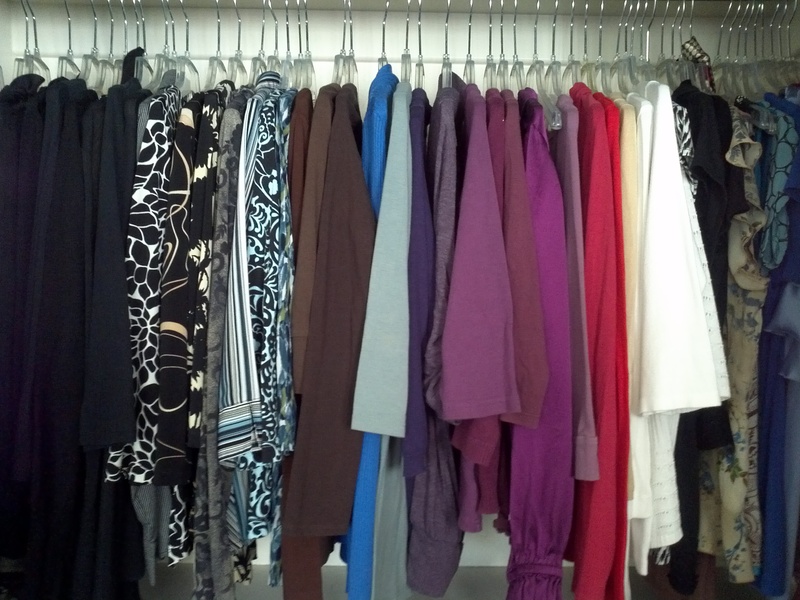 I think that even if I did have a walk-in closet, I would still pack off-season items away. 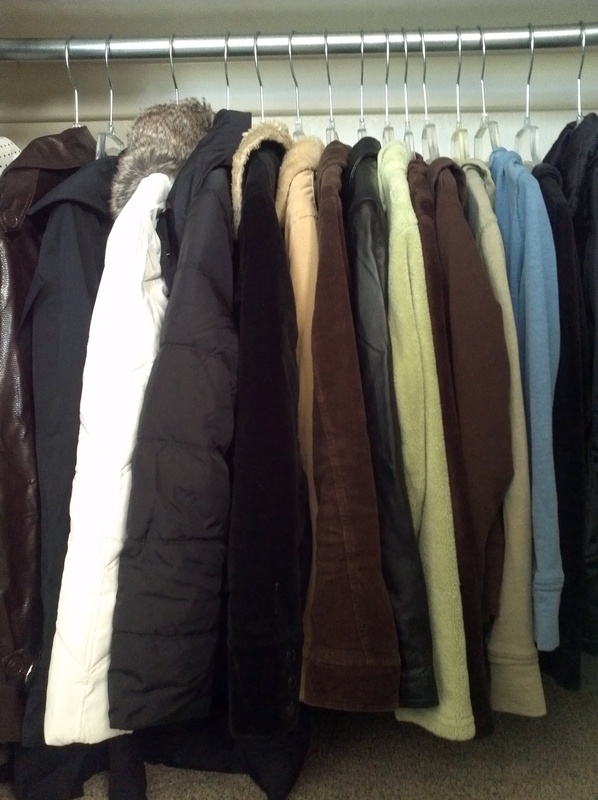 I mean, do I really want to see winter coats when the temperatures outside are hitting 115 degrees F? Emphatic, “No!”. Although I do keep a handful of short-sleeved tops in my closet to wear under sweaters and jackets, I don’t want to be taunted by a closet full of them all winter long, making me wish for warmer days. 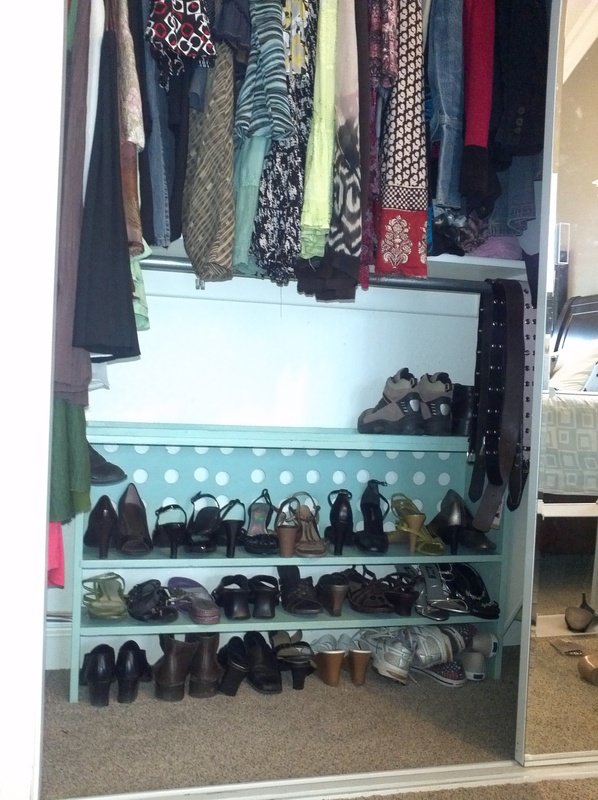 Bottom line: I just got a “new” wardrobe last weekend and it didn’t cost me a dime! How about you? Do you switch out your wardrobe, too? Wanna see one of my favorite tools in this whole world? 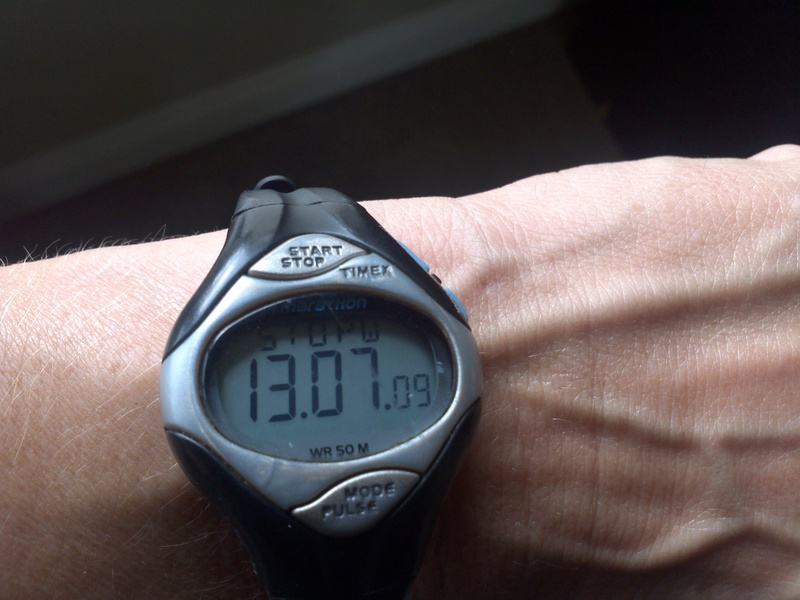 My Timex Marathon watch. I have been wearing this little number for years and years. Every time one breaks, dies, drowns… I get all panicky until I have a replacement on my wrist. I haven’t seen them in stores for a while, but Ebay has come through for me with the last two replacements. (Thank you, Ebay!) So, why is this little guy so handy? First of all, I love the timer. It easily sets the time in 1, 3, 5, 10, (you get the idea) minute increments. So great for, “You have 5 minutes to get your pj’s on and brush your teeth.” or “Time for a 10 minute tidy”, or “15 more minutes on the computer, then it is your brother’s turn”… I could go on all day. My watch becomes the” bad guy” and I’m just the enforcer: “Sorry, guys. The watch has spoken.”. Timex also encourages me to get chores done that I have no desire to start. I set the timer for 3 minutes to get my dishwasher emptied and try to beat the beep-beep-beep. Another function that I use regularly is the stopwatch feature. I like to time myself doing projects just to prove to myself that many dreaded projects really don’t take as long as we think they will take. That is is exactly what I did this morning. See that 13.07.09? 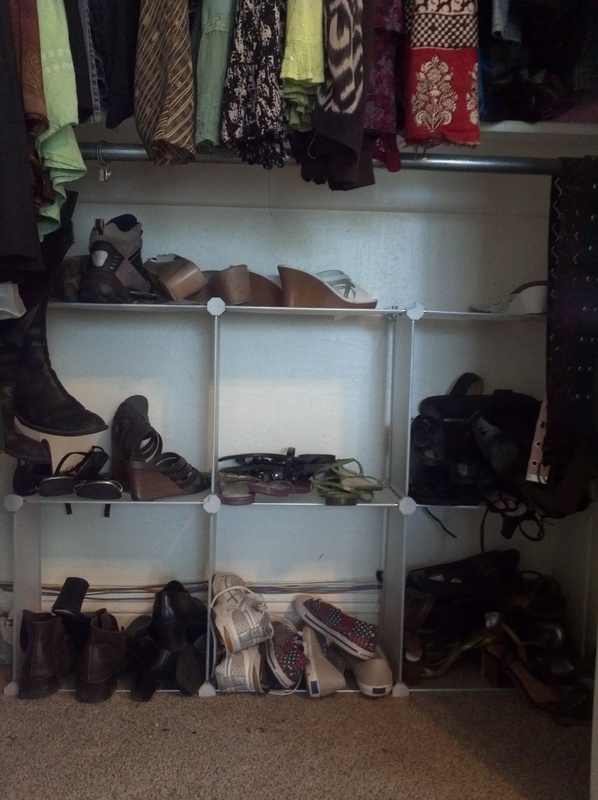 It is significant for a shoe organizing project that I did this morning. This morning I looked at my shoe storage unit and was quite underwhelmed. That’s 3 bucks if you can’t read the fine print! At first I had grand ideas of painting, distressing it a bit, then staining the piece, but then I decided that I really like the color, and it is just going in a closet anyway. Done! Here is where Timex Marathon came in. I decided to time the whole project with my stopwatch. In 11 minutes, 28 seconds (11.28) I had cleaned the piece, pulled out my existing shoe organizing unit plus shoes and replaced it with the” new” one, and added the shoes. 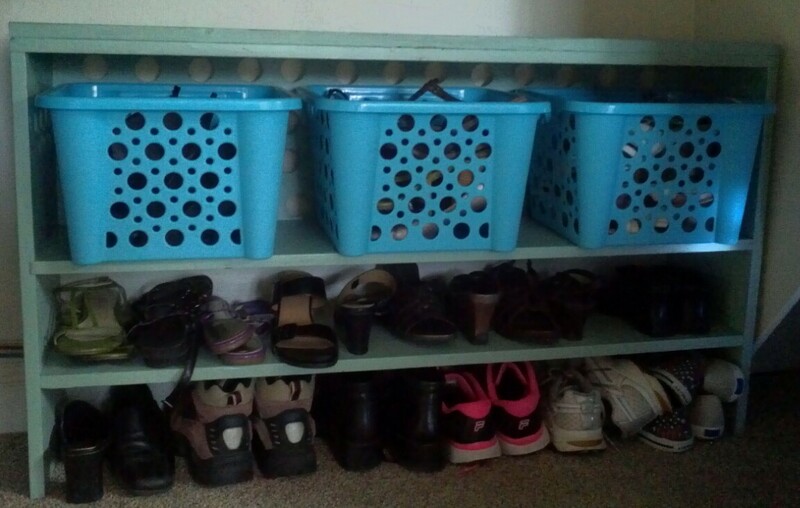 I rarely wear some of those high-heeled shoes and they topple over so easily, so I decided to grab some Dollar Tree bins (which I already had) to toss them in. Of course I turned on my stopwatch to continue to keep track of the time. Gorgeous? Nah. Magazine worthy? Heck no! But, I just close the closet door and walk away, knowing that in just 13 minutes, 7.09 seconds I have finished another project. Done! At least until the boots come out of the bin in the garage and the sandals go “bye-bye” for the winter. That ought to take me, what… about 5 minutes. What project are YOU going to find time to do today?